Korean Skating Union: The ‘Biggest Loser’ in Sochi? South Korea has a lot of work to do before the 2018 Winter Games in Pyeonchang. It was South Korea’s Winter Games of Discontent. Coming off a historic performance at the 2010 Vancouver Olympics, South Korea was supposed to assert itself as a winter sports power in Sochi, as it gets ready to host the 2018 Winter Games in Pyeongchang. Instead, the Korean contingent had the most disastrous Games imaginable. After taking home 14 medals, including six golds from Vancouver, South Korea totaled just eight medals (three golds) in Sochi, finishing 13th in the medal standings. The Wall Street Journal even piled on by naming the nation the biggest loser in terms of last-place finishes. The raging controversy over Yuna Kim’s loss to Russian figure skater Adelina Sotnikova certainly affected South Korea in the medal standings, with the perception that Kim was robbed of a gold because of nebulous politics. But in the big picture, that merely affected the placement of one medal. The true cause of South Korea’s downfall in Sochi can be summed up in the loss of one athlete: Viktor Ahn. As Ahn Hyun-soo, he won four medals (three golds) at the Turin Games in 2006 on the short track for South Korea. Then, in a story chronicled here at The Diplomat, Ahn had a falling out with the South Korean federation and was essentially drummed out. He resurrected his career in Russia and began competing for his new country last year. Ahn was nothing short of spectacular in the Sochi Olympics, again winning four medals (three golds) and single-handedly putting Russia, which had never medaled in this discipline, at the top of the final medal standings. Ahn also became the most decorated short-track Olympian, tying with Apolo Anton Ohno with eight medals (but with six golds to Ohno’s two). Meanwhile, the South Korean men got how many medals on the short track in Sochi? Zero. It was by far the team’s worst showing since short-track speed skating became an Olympic sport in 1992. Ahn’s conquests, of course, were of particular interest in South Korea. His native countrymen by and large cheered for his success while taking out their frustration on the South Korean federation. The website of the Korean Skating Union (KSU) crashed on Sunday thanks to a barrage of angry messages blaming federation officials for losing Ahn. “We all root for you, Ahn Hyun-Soo! I’m so happy that you won gold instead of our corrupt South Korean team!” wrote one poster on the KSU site. The sentiment is so overwhelming that it has already prompted President Park Geun-hye to direct her country’s Ministry of Culture, Sports and Tourism to launch an official inquiry into how KSU does its business. Ahn himself, while reveling in his own achievement, is taking no pleasure in the demise of his former teammates. His father, who brokered Ahn’s passage to Russia after the falling out with KSU, went as far as calling his son’s victories bitter-sweet. But if South Korea were to regain its momentum as a major competitor in the Winter Games – lest it gets humiliated in front of home fans four years hence – it needs to do more than not losing a legendary athlete. It needs a better repertoire. Aside from Kim’s pair of medals in figure skating, South Korea has only won Olympic medals in short-track and regular speed skating. The Korean contingent brought a record 71 athletes to compete in 13 disciplines in Sochi, but found little success in any new sport. They’ll need to improve dramatically in the next four years for a respectable showing in Pyeongchang. China (9 medals, 3 golds, 12th)– After a record-setting performance in Vancouver (11 medals with five golds), the Chinese regressed a bit in the medal standings but were still good enough to lead all Asian countries. The major disappointment came in figure skating, where a strong contingent failed to medal in any of the five events. Japan (8 medals, 1 gold, 17th) – Unlike South Korea and China, Japan was coming off a disappointing Vancouver Games (five medals with no gold). Yuzuru Hanyu helped the team avoid another gold-less performance by winning the men’s figure skating, despite falling twice in the long program. The Japanese ski jumping team proved a pleasant surprise, taking three medals, including a silver in Nordic combined. 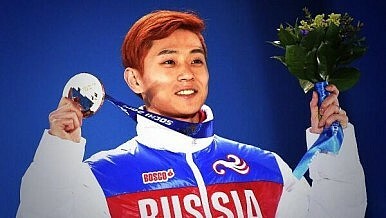 Kazakhstan (1 medal, 26th) – Dennis Ten won a bronze in men’s figure skating to become the first Asian athlete (Ten is of Korean descent) to medal for the country. The Kazakh men’s short-track relay team had a chance to win a second medal, but was nipped at the finish by China for the bronze. After being shunned by his native South Korean team, Ahn could win gold for Russia.